Google AdSense is definitely a fantastic means to earn some extra money from your blogs and articles. If you plan to make use of AdSense, you have to undergo a complex process for creating an AdSense account and getting approval from Google. Yes, it is a big deal to get approval for Google AdSense, which most bloggers would dream of. Many times, Google would block your AdSense account for violating their policies and put you through the trouble. When the Google AdSense account is blocked, one of the best solutions is to look for alternatives to Google AdSense. While all alternatives may not be better than Google AdSense, but it depends a lot on what your website niche and traffic is like. Depending on these factors, some of the Google AdSense alternatives can be better than AdSense itself. 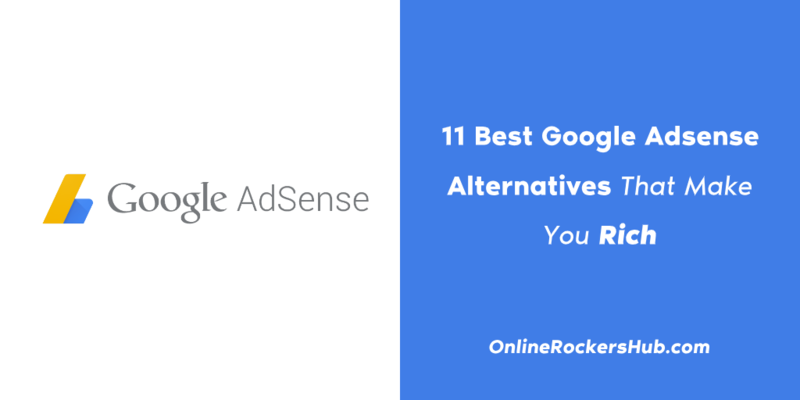 Being said that, here are 11 Best Google AdSense alternatives Ad networks. Disclosure: Some of the links in this post are referral links. We receive a small commission from these platforms when you join them and generate revenue out of it. Thank you! Chitika is touted as one of the best Google AdSense alternatives. Being a contextual ad network, it shows ads that are relevant to the content. Thus, the click-through-rate and earning would increase for you. All you have to do is get approval from Chitika, which is mostly easy even for a blog with lesser traffic. After getting the approval, you can either use Chitika plugin which is good for not-so-tech-savvy people or directly enter the code in the blog. One of the perks of Chitika is that it works alongside AdSense on the blogs. Also, Chitika is very similar to Google AdSense which makes it easier for people to use Chitika who use AdSense. Since it is pretty easy to customize, Chitika has already become popular. Chitika would work well for the websites having content that is not too targeted. Chitika pays via both PayPal and check. If your content is about products and it has product related keywords, Skimlinks is an ad network that helps you make money from the content. As many say, Skimlinks is one of the most effortless ad networks for making easy money from content. For anyone who is looking for an ad network that doesn’t require the sign-up hassles, creating affiliate links, or wait for approval. Skimlinks works by automatically creating affiliate links based on the content on the website to share products that are relevant for the users. For example, if you are talking about a pair of Levi’s or denim in the content and add a link to the online store that sells the denim, Skimlinks would automatically change it to an affiliate link. Skimlinks helps to overcome the hassle of needing to partner with networks for earning money. There is no negotiation anymore with Skimlinks. VigLink is yet another ad network that works pretty different as compared to other ad networks that we have mentioned and would mention later. When you use VigLink, your standard outgoing links would be converted into affiliate links. Now, once the links are converted to affiliate links, whenever the users purchase an item through this link, you would receive the commission for it. Media.net has the reputation of being an ad network that is closest to the AdSense. Media.net is an ad network that powers Bing and Yahoo!, two of the biggest search engines after Google. So naturally, it is the second largest contextual ad network after Google AdSense, which makes it a serious alternative to Google AdSense. The good thing about Media.net as compared to Google AdSense that makes people love it is that it aims to serve bloggers- both small and large. The parameter for Media.net is high-quality content. All you have to do to get the approval is that ensuring your blogs are of good quality and purposeful, having a particular target. The payment is made via PayPal or wire. The dashboard is powerful where you easily find stats, reports, and graphs to keep track of your earnings based on time-period. Also, it offers the highest revenue per thousand impressions, which makes it a good reason for people to use it. While the majority of ad networks wouldn’t allow sticky sidebar ads, you’d get it by the use of Media.net. The next best thing is that once you are a part of the Media.net client base, you can access the customer support services conveniently. When we talk about alternatives to Google AdSense, Yllix is one of the relatively newer ad networks (started in 2012) that have suddenly become a lot popular. With a very simple and easy to understand homepage, Yllix stills offers an incredible ability of customization. Whether you want a pop-up ad, pup-down ad, slider ads, mobile redirects, layer ads, or even full-page ads, Yllix would help you do it. Also, for full-page ads, you can customize and choose any size based on what you want. With a simpler interface and the process of using, it is a pretty good ad network as an alternative to Google AdSense for beginners. Adsterra is an ad network that is more apt for publishers that already have a pretty good CPM and work with a number of ad formats, gathering traffic on both desktop and mobile. The kind of ads you would like to see on your page is entirely customizable using Adsterra. For the best CPM on your traffic, you can choose anything out of direct links, banners, pop-unders, and other option that Adsterra offers. If you are a novice at blogging, you may start by using another ad network rather than Adsterra. Adsterra pays you via different means, which makes it all the more convenient based on your preference. Some of the modes of payment are- Bitcoin, WebMoney, PayPal, ePayments, Paxum, wire, and several others. RevContent is popular for being a native ad network. The thing with native ads is that they are quite homogenous with the blogs and websites as compared to regular banners. Many popular publishers, like NBC news, CBS, etc., use RevContent for native ads. Even within the category of native ad networks, there are plenty of options. However, since RevContent provides a better customization option along with responsive widget, infinite scrolls, and some other perks, publishers prefer it over other native ad networks. The reason why RevContent is touted as one of the best Google AdSense alternatives is that of its popularity among publishers. However, one catch of using RevContent is getting approval. RevContent has a reputation of rejecting about ninety percent of applicants. It has an eye for websites that may opt for a premium account. If that is foreseen, that is when an application is approved. For bloggers that depend majorly on Indian traffic, Cuelinks works well, even better than Google AdSense. However, if a blogger wants to use AdSense as well as Cuelinks, then he can proceed with both. It also works fine with other ad networks, like Skimlinks and Viglink. It just requires a one-time setup, after which you are ready to go. After you sign up with Cuelinks, you receive a line of codes. Once you place them in your blog’s source code, your standard links that go to Indian sites are converted to affiliate links. Pretty much like Viglink, for each purchase that a customer makes using your link, you would be paid a certain amount of commission for the purchase. Some of the sites that provide good commission through affiliate links are- FabIndia, Amazon India, Flipkart, Airtel Broadband, Jabong, and many more. Propeller Ads is yet another well-established ad networks. While it is a relatively newer ad network that started in the year 2011, it grew pretty quick to become popular. However, when you decide to use PropellerAds media as an alternative to AdSense, you should know that PropellerAds Media works better for only for certain niches. If your website covers games, dating, entertainment, movies, gambling, or any other niche of that sort, PropellerAds Media is a great option for you than AdSense. You would find both pop-unders and banners on PropellerAds, but pop-unders work better. PropellerAds are for websites that are trying to make money through ads in countries, like India, South Africa, etc. Also, PropellerAds helps in making money from mobile services and apps. So, if you are getting mobile traffic, then using PropellerAds network would be a great idea. 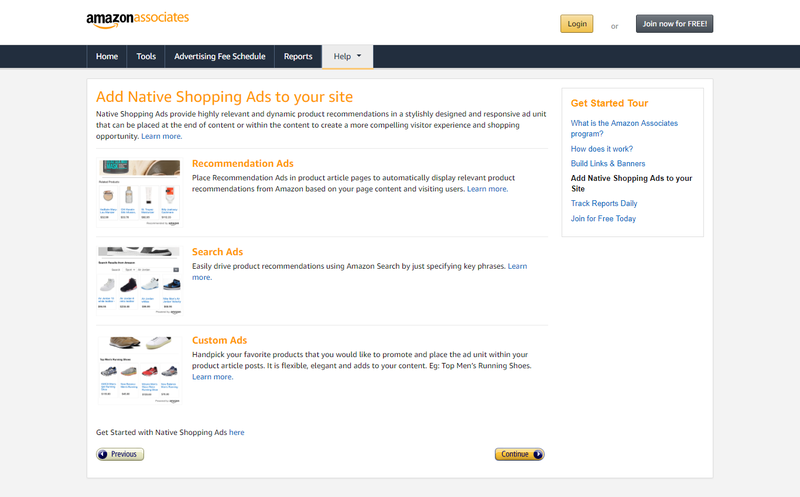 Amazon Native Shopping Ads is an Amazon exclusive ad network. This means, if you are writing a blog about some amazon product, you can choose Amazon Native Shopping Ads. The way this ad network works is pretty apt and straightforward for people who are looking for making a decent amount of money from their blogs. When you write about a specific product that is on Amazon and persuade people to buy it, Amazon Native Shopping Ads would pay you a commission on each successful purchase. Amazon Native Shopping Ads do not work like other ad networks that on the basis of pay per click. Instead, for each purchase through your link, you get a commission from Amazon. It also would let bloggers use dynamic image ads to the blogs. This helps in promoting Amazon products in a better way. Amazon associates can be used along with AdSense. The money is credited to the bank via wire transfer or check. Join Amazon Native Shopping Ads! Out of the many AdSense alternatives that have an easy request to approvals and sign-ups, Adversal is one of them. One factor that users love about Adversal is that instead of paying for clicks, it pays for impressions. The advertisers get the option of geo-tagging, using which, they pay a lot for their ads to make it to the target audience. This adds up to the amount of money that publishers can earn using Adversal. The types of ads you can get using Adversal are- leaderboard, banners, Ministitial, pop-under, skyscraper, wide skyscraper, and medium rectangle. Out of so many, the most in-demand type of ad that most people prefer is pop-under. Another bonus for new and small bloggers for using Adversal is that the minimum payout is really low, that is, $20. Additionally, the CPM rates are high too. Using Adversal, you can also easily track different ad campaigns. These are 11 of the best alternatives that you can use for Google AdSense. Most of them work well along with Google AdSense, which means you can always try them besides Google AdSense. While Google AdSense is the highest paying ad network, the approval rate is so low that bloggers who look forward to making money from blogs would definitely need an alternative. Moreover, for most bloggers, the constant fear of being blocked is one significant insecurity. It is a fact that a vast amount of money comes with various conditions and strict guidelines for bloggers to swear by. So, giving try for these AdSense Alternatives means a lot if you are serious about earning through your blogs. Also, thorough background research helps you figure out which ad network would be beneficial for your website and niche. With all of that being figured out and put in place, you might end up making a lot more money from these small ad networks than Google AdSense. Eventually, it is not about what ad network you use, it is also about the amount of revenue you make through any particular ad network. Note: These best Google Adsense alternatives are contributed by Jafar Sadhik. If you have exciting content to contribute, then check my guest blogging guidelines. Want to Grow your Income to ₹5000/day? Newsletter subscribers get FREE access to 15+ Guides & Checklists to boost Income. A creative content developer, specialized in SEO content writing and has an experience of 4 years in digital marketing. He currently works at Stan Ventures, an Indo-American white label SEO service provider. He loves to read thrillers of Agatha Christie and the latest trends and updates in the online world. Thanks for the valuable insight Hasan. I do accept, what works for me might not work for you. As the blog niche changes, the performance of these ad networks also changes. So, it is wise to keep trying out different advertising networks and choose the one that suits you. I have always relied on affiliate marketing more than Google Adsense. Because, you need more traffic to monetize at Google Adsense. But, with Affiliate Marketing it is not the case. You just need targetted traffic to drive affiliate sales.